An evening of dance music brought to you by Empty Orchestra. Performances from The Wyrding Module and Shelly Knotts, videos and visuals from Beth Bramich, Katherine Fishman, Simon Raven and a DJ set from Empty Orchestra. The Wyrding Module is a solo project from paramusicain Chris Gladwin. Drawing inspiration from Kosmische Musik, Mantra-Rock and Post-Industrial Ambience, The Module pulses spectral beats wrapped in the ritual and seduction of club night euphoria. Doused with equally hypnotic visuals, prepare for your Kosmische-Doom-Ragas initiation. Chris Gladwin is mainly known for his electronica output as one half of Team Doyobi with long time collaborator Alex Peverett, but also works under the alias Dr Derek F. Livet Er Smerte. Highlights of his illustrious career have included: touring with Autechre, jamming with Damo Suzuki, improvising with a parrot, building a mashed potato synthesizer, and making it to Oslo and back in a jeep, with no headlights, towing a Kebab machine. Shelly doesn’t usually make dance music but we have invited her to try it out. This Birmingham based composer of instrumental, electroacoustic and live electronic music is usually more at home performing and composing for her multifarious projects and collaborations, which include BiLE (Birmingham Laptop Ensemble) and Interleave (a jazz quartet and laptop collaboration). She is also a member of the sound art collective SOUNDkitchen and organiser of Network Music Festival – one of the worlds only dedicated networked music festivals. 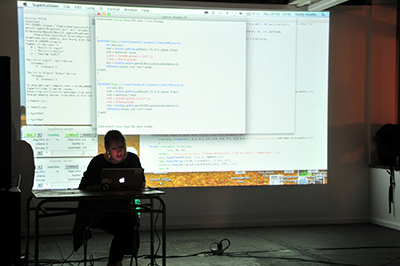 Shelly will present the results of her research into popular dance music as a performance of live coded improve and messed up beats. Expect an audacious debut onto an unfamiliar dance floor! Through the medium of the animated GIF, Beth Bramich will look into to the potentially oppressive nature of night club visuals. Beth Bramich is a writer and curator. From 2010-12 she was curator of In Production, a regular feature of Nottingham Contemporary’s public programme. 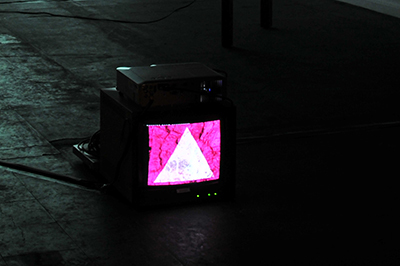 In Production was a platform for new and emerging artists working in video to show unfinished work. Beth has contributed articles to Nottingham Visual Arts (2010-13), a-n Magazine (2010) and this is tomorrow (2012-13). Katherine Fishman has made a new video work “In An Attempt To Mirror Your Motions”. Two conversations are show in parallel: On-screen two dancers move and speak, though their conversation is unheard. This is edited together with an off-screen discussion about gesture, self-awareness and ‘locking limbs’. 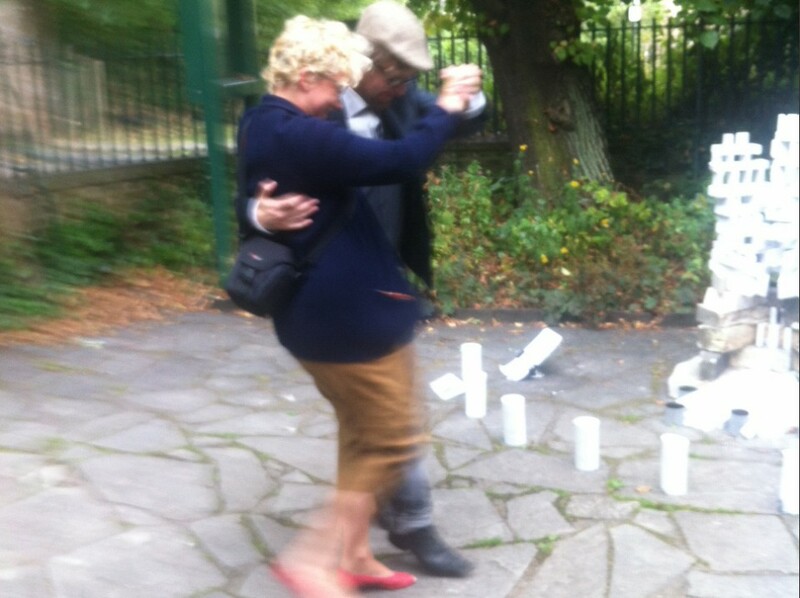 Katherine Fishman graduated from Nottingham Trent university in 2012, her practice takes inspiration from observed social situations, details of the setting, unfinished sentences and unexpected gestures are frequently explored in her video and performance works. Simon Raven is producing dance visuals for your viewing pleasure! Simon Raven (b.Nottingham,1978) studied BFA at The Ruskin of Drawing and Fine Art, Oxford, and MA Sculpture Royal College of Art, London (grad 2004). He is currently based in Nottingham, where he is a resident artist at Primary. 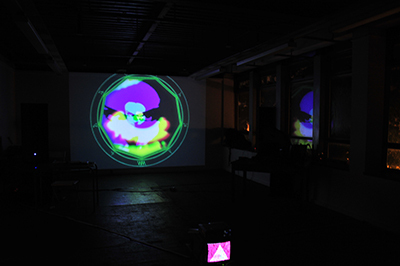 Raven makes concept-led work across media, including performance, painting, video, sound and sculpture/installation. His practice is generated in response to place and exhibition specifics, often with an element of humour or protest.